It tells of a cat called Ribby and a tea party she holds for a dog called Duchess. Complications arise when Duchess tries to replace Ribby's mouse pie with her own veal and ham pie, and then believes she has swallowed a small tin pastry form called a patty-pan. Its themes are etiquette and social relations in a small town. . . .A pink and white pie-dish! and so is mine; just like Ribby's dishes; they were both bought at Tabitha Twitchit's." "It is all ready to put into the oven. 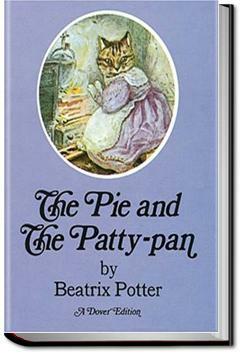 Such lovely pie-crust; and I put in a little tin patty-pan to hold up the crust; and I made a hole in the middle with a fork to let out the steam—Oh I do wish I could eat my own pie, instead of a pie made of mouse!" "A pink and white pie-dish—and you shall eat it all. 'You' means me—then Ribby is not going to even taste the pie herself? A pink and white pie-dish! Ribby is sure to go out to buy the muffins.... Oh what a good idea! Why shouldn't I rush along and put my pie into Ribby's oven when Ribby isn't there?" a cat and dog having afternoon tea, if only. This was very funny, a poor little dog with poor doggy manners has a dietary predicament, she's mus-intolerant, so how in the world is she to stomach a mouse pie? This is not the best book to read to rodents, unless they have a very dark sense of humor. You know, in today's world (if we had talking cats and dogs who invited each other over for tea, that is) Duchess the Dog would simply have informed Ribby that Cat that she was allergic to mouse, and then none of this mess would have happened. Поредната сладурска книжка от поредицата "Детство мое". Mouse and Bacon pie anyone? ?